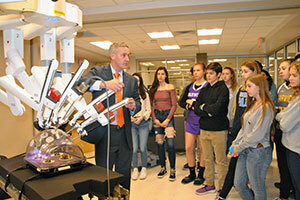 Warwick Valley High School students recently had an opportunity to learn about the robotic da Vinci Surgical System, used in many hospitals. 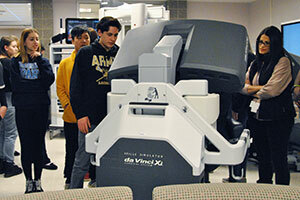 Guided by a professional trainer who explained how the robotic equipment works, students had an opportunity to try out the training console to see what surgeons experience while performing surgery using this system. The da Vinci® Surgical System enables surgeons to perform delicate and complex operations through a few small incisions. 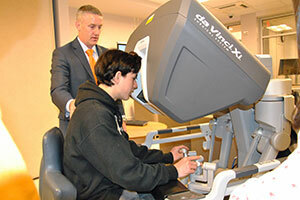 Using the system, a surgeon operates seated at a console while viewing a high definition, 3D image inside the patient’s body. The surgeon’s fingers grasp the master controls below the display with hands and wrists naturally positioned relative to his or her eyes. The system then seamlessly translates the surgeon’s hand, wrist and finger movements into precise, real-time movements of surgical instruments. 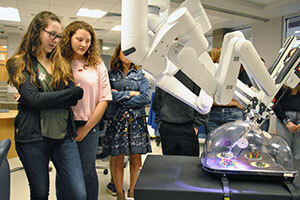 The District is grateful to the Intuitive Surgical Company for providing this unique learning experience for our students.